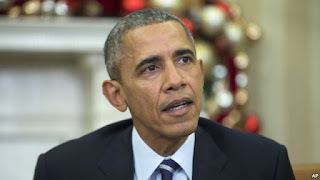 President Barack Obama used his weekly address Saturday to vow America "will not be terrorized" following the California mass shooting, which the FBI said it is officially investigating as an act of terrorism. "Our hearts are with the people of San Bernardino – another American community shattered by unspeakable violence," Obama said about the deadly attack by a married couple on a California social services office that left 14 dead and 21 injured. He also renewed his calls for tighter gun controls a day after the Federal Bureau of Investigation said a number of pieces of evidence have turned up to make the shooting a terrorist act, including signs the massacre was extensively planned. "As president, my highest priority is the security and safety of the American people. This is work that should unite us all – as Americans – so that we're doing everything in our power to defend our country," Obama said in his weekly address. " We are Americans. We will uphold our values – a free and open society. We are strong. And we are resilient. And we will not be terrorized." On Friday, David Bowdich, assistant chief of the FBI's Los Angeles office, would not talk about the specific evidence, but he did say it includes crushed cellphones found in a garbage can near the site of the killings. Bowdich said there were "telephonic connections" between the suspects and others, and that the phones could reveal "potential golden nuggets." Bowdich said he had seen the Facebook posting where the wife involved in the massacre, Pakistani Tashfeen Malik, pledged allegiance to the Islamic State militant group. The message was apparently posted on Facebook about the same time the shooting started but Bowdich said he could not give any further information. The Islamic State said on its radio broadcast Saturday the husband and wife were "supporters" of the terrorist group. "We pray to God to accept them as martyrs," al-Bayan Radio said. FBI Director James Comey said there is no indication the couple was part of a terrorist cell or network. He also said that much of the evidence in the case "doesn't quite make sense." Pledges of loyalty to IS leader Abu Bakr al-Badhdadi have been reportedly found in social media posts by others who carried out mass killings. Some Islamic State supporters posted messages on Arabic social media hailing the massacre and congratulating the killers. Some of them promise more attacks in the the United States. Two attorneys representing the family of the man involved in the massacre criticized the media for what they say is a rush to judgment that this was a terrorist attack simply because the suspects were Muslim. Lawyers David Chesley and Mohammad Abuershaid said they and their clients met with the FBI for four hours and say the family is totally shocked because the couple never showed extremist or aggressive behavior and never mentioned Islamic State. Chesley said the FBI has no "clear smoking gun" evidence pointing to terrorism and that agents appeared to be "frustrated" that all they could find were Facebook accounts set up under different names. The FBI's Bowdich said it is unknown at this time if anyone else in the United States or overseas was involved. He also said it is possible that a second attack may have in the planning stages but made it clear to the public and reporters hungry for information that this will be a very long and complex investigation. Friday, news crews were given a tour of the couple's home by the building's landlord. Reporters peered into closets and rifled through documents. Malik and her husband, Syed Rizwan Farook, killed 14 people and wounded 21 Wednesday in a conference venue being used by the local government agency Farook worked for in San Bernardino, about an hour's drive east of Los Angeles. Witnesses say Farook was at the event, left, and returned with his wife. Witnesses said both were heavily armed with rifles and handguns and dressed in military-style clothing. They left behind a pipe bomb that failed to explode before fleeing in a black SUV (sports utility vehicle). Police spotted the vehicle in a nearby residential neighborhood and the couple was killed in a shootout with officers that left the car full of bullet holes and the windows shattered. Two officers were wounded, but not seriously. Police later discovered 12 pipe bombs, bomb-making materials and thousands of rounds of ammunition in the couple's home. Friends, family, and co-workers say they have no clues what sparked the couple to carry out their massacre. Neither had a criminal record and were not on any government watch list. The Chicago-born Farook was a local government health inspector in San Bernardino. Friends say he was religious and dedicated to Islam, but cordial, liberal-minded and well-liked. He met the Pakistani-born Malik through an on-line dating site.The two met in Saudi Arabia and married. She came to the United States on a fiancee visa. The couple were parents of a 6-month-old girl, whom the couple left with Farook's mother the morning of the shooting. Some of Farook's friends say he returned from Saudi Arabia a changed person. The massacre stunned the U.S. Muslim community, whose leaders say they are as heartbroken and as horrified as everyone else. "There's a lot of anxiety among American Muslims because we have seen it in the past." said Nihad Awad, the head of the Council on American-Islamic Relations. "We've seen what jumping to conclusions means and how it impacted our lives." Wednesday's mass shooting was the worst in the U.S. since a mentally ill man gunned down 26 children and teachers in a Connecticut elementary school in 2012. It also was the 353rd time this year that four people or more were killed or injured in a single mass shooting incident, and has added more fuel to the debate over gun control. The weapons used in San Bernardino were bought legally. President Obama said it is just too easy" for people to buy guns in the United States. He said what happened Wednesday should spur lawmakers in Washington "to take basic steps to make it harder, not impossible, to get weapons." The president met with former congresswoman Gabby Giffords and her husband, Mark Kelly, on Friday to talk about ways to help reduce gun violence. Giffords was shot and nearly killed in a gunman's rampage in her Tucson, Arizona district in 2011.